Today’s featured guest is Dave Krolak of Cas’ Pierogi & Kielbasa food truck. Dave and his wife Lynn started their Polish restaurant on wheels in early 2017 and their business has been growing quickly ever since. Dave got the idea to start a food truck while attending an event that featured a half-dozen different Italian vendors selling different varieties of sausage and meatball sandwiches. What stuck out to him was that there didn’t seem to be anything that represented his Polish heritage. It was a “crazy idea” that could have been easily forgotten. But Dave decided not to let the idea pass. After getting buy in from his wife and partner Lynn, the husband and wife team quickly started to put their business into motion. Selecting the menu for the truck was easy. Dave drew the menu directly from the tastes of his childhood. Dave’s father, Casimir J. Krolak or “Cas”, was a Polish-American WWII veteran that maintained a love of Polish food and polka music his entire life. The truck has become a tribute to his memory as well. In addition to serving authentic Polish food, it was important to Dave that the food is prepared and served in the traditional way. Listen to the full podcast interview to learn the full story. If you happen to live in New Jersey, check their website to see where the truck will be serving next! 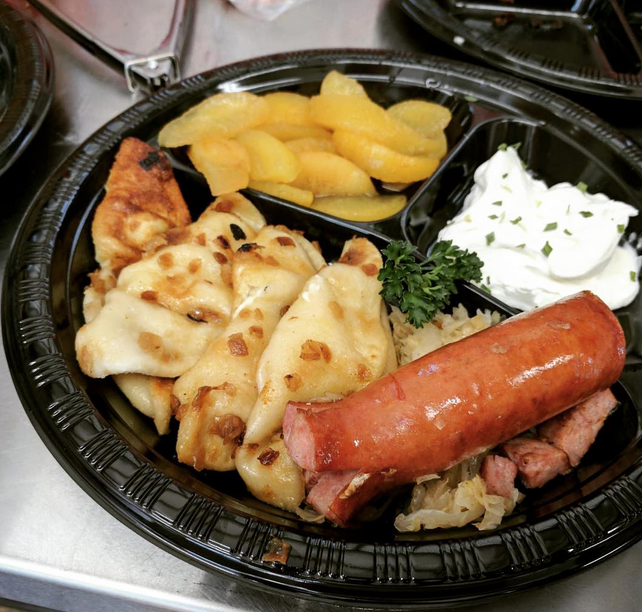 A heaping plate of Pierogi and Kielbasa. In life we think about things from time to time, you get an idea and think “Oh, we should run with that!” and then a week later or two weeks later it fades away. Well this kept hitting me. – Dave Krolak on the idea to start a Polish food truck. To find somebody in the industry that’s friendly and successful and ask them to give you their advice. I would say that’s a good way to start. – Dave Krolak on the importance of finding a business mentor. Almost every week we had pierogi and kielbasa as a staple meal just like Italian folks have spaghetti or lasagna. – Dave Krolak on using family recipes to create his food truck’s menu. You really need to have a menu that’s going to separate you from the other folks. – Dave Krolak on the importance of menu development. Coming up with a good menu that people are going to be excited about and want to try. Then making sure that you are seeing that people know about you and I talk about it every place I can. – Dave Krolak on running a successful food truck. The official headquarters of Cas’ Pierogi & Kielbasa Food Truck. 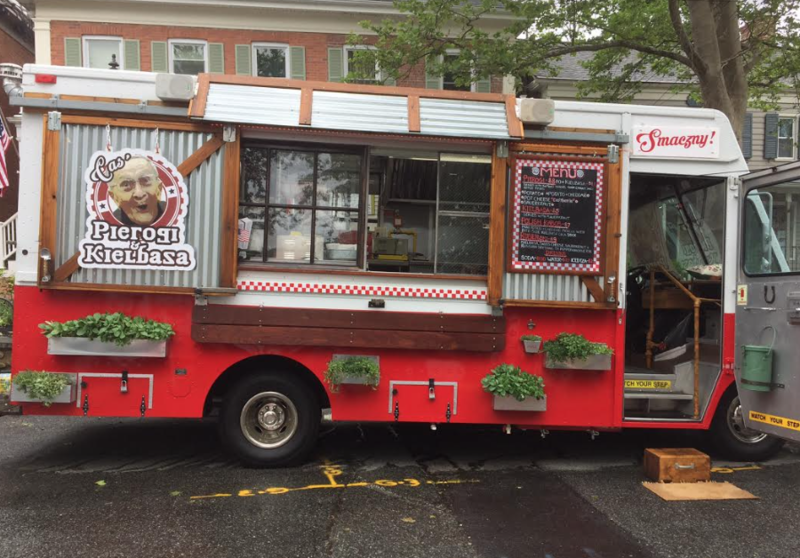 Cas’ Pierogi & Kielbasa Food Truck – This week’s featured interview is with Dave Krolak, owner of Cas’ Pierogi & Kielbasa Food Truck out of Basking Ridge, New Jersey. Dave started the truck in 2017 with his partner and wife Lynn. Small Business Development Center – Non-profit organization that offers advice and training for people interested in starting a new business free of charge. Dave got valuable feedback about his mobile food business here and recommends the organization to others. Johnny’s Pork Roll – This is a popular food truck in New Jersey area serving pork rolls, basically a type of breakfast sandwich that you can enjoy all day long. John, the owner of Johnny’s Pork Roll, has been one of Dave’s business mentors. Monmouth Beach Food Truck Takeover – If you happen to live in the New Jersey, you can taste Johnny’s Pork Roll and Cas’ Pierogi and Kielbasi at this awesome event. Food Truck Academy Interest Form – Dave was in the last Food Truck Academy program launched in early 2017. Interested in starting your own food truck? Sign up to be informed when Food Truck Academy will open up next in October, 2017.